I never did get close to them, however, they did get close to me under not so great of circumstances. 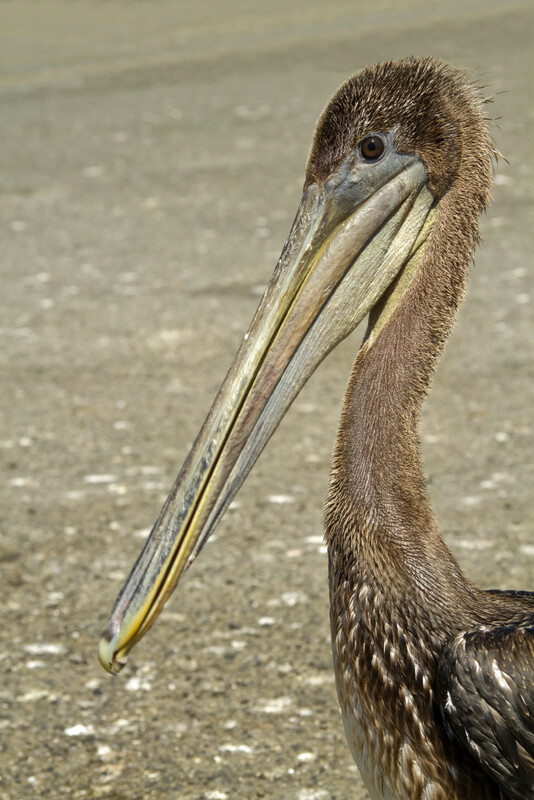 Adult Brown Pelicans (Pelecanus occidentalis) have dark brown bodies with white to yellow necks. They have long, beaks tinged with red that end with a little hook. While flying, they keep their pouches tucked tightly under their beaks. These birds are often seen in small groups, wings out to their full 6-8.2 ft. wing span, flying close to the water taking advantage of what’s called the “ground effect”. 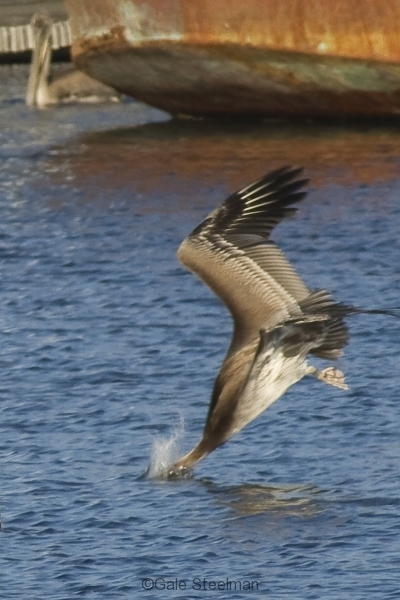 There is less drag close to the water which allows the Brown Pelican to travel great distances in a short period of time with a lot less effort than flying higher above. Brown Pelicans breed from Anacapa Island, California south to Chile and from Maryland to Venezuela and Trinidad. They nest in mangroves and lay two or three eggs in March or April. The chicks reach their full size in a month, fledge in 63 to 76 days and reach full maturity in two to five years. After breeding, they head north and may be seen as far as British Columbia and Nova Scotia. The Brown Pelican population declined in the early 1900’s due to the many plume hunters who stalked them for feathers in the olden days. After recovering from that, they suffered a huge blow from ongoing pesticide poisoning. DDT, the primary component, was banned in 1972. This legislative move aided in the rebound of this elegant flyer. They were taken off the endangered species list in California in 2009. However, they continue to struggle due to recent crashes in sardine populations, injuries from fishing lines and hooks an d oil fowling. The 2011 Fukishima tsunami destroyed the harbor in Crescent City. Locals, myself included, came down to watch workers tear out all the docks and remove all but a few boats from the basin. That summer, Brown Pelican juveniles began arriving at the harbor and came so close they were flying over the parking lot. Some days I would go and sit on a ledge with my camera while they came within 20 feet of me. They were more than filling my frame and I thought that, for a photographer, this was about as good as it could get. Sometimes I would shot 1,000 to 2,000 pictures within a couple of hours. As the summer wore on the juveniles began clustering around the fish cleaning stations, begging for an easy meal. 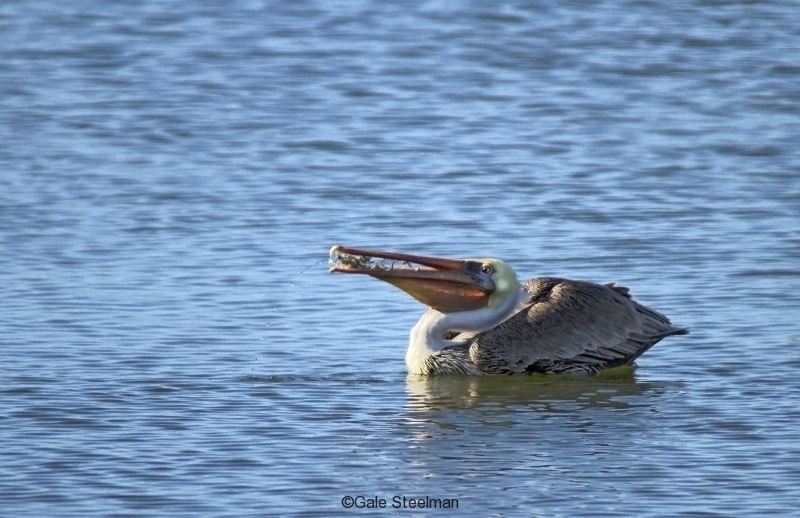 Most of them were feeding off of fish heads and tried to swallow them whole as pelicans do with all their prey. But their usual prey is much smaller. I was alarmed to see these innocent young creators casually walking around among the fishermen with 5″ fish heads lodged in their pouches. Some of them were so hungry that when one pelican would open its mouth, the other would try to steal the head right out of its pouch! 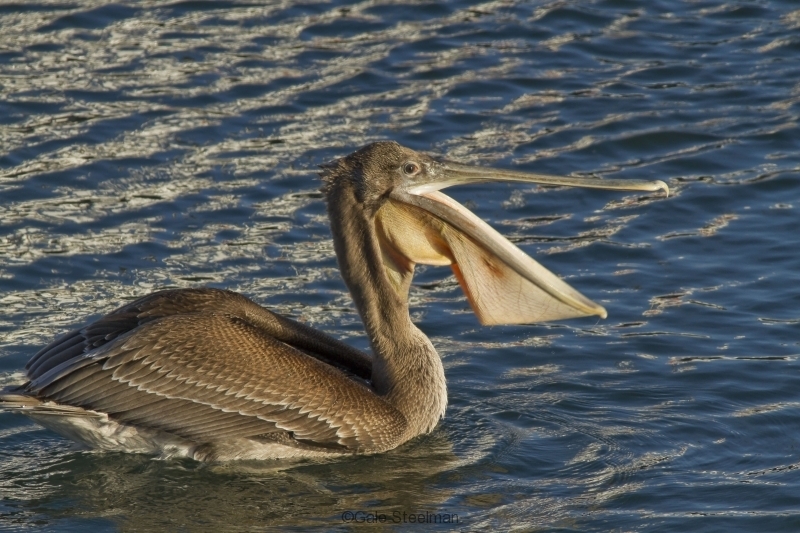 Although most of them continued to walk around with the fish heads in their pouches, once in a while a lucky pelican was able to gag one out. Oiled Juvenile Brown Pelicans standing with their friend who has a fish head stuck in his pouch. I was really surprised at their trust in humans and the close proximity at which they would stand to us. I sat down on the curb with camera in hand and watched the spectacle unfold. Eventually one of the juvs walked up to me and stood within 2 feet of me. For a while I didn’t move for fear of startling it. Once I realized he had absolutely no fear of me, I removed my lens cover and started to shoot. This time I wasn’t thinking that for a photographer this was as good as it gets, this was monumental! Suddenly, from out of the corner of my eye, I could see the figure of another pelican coming in for a landing. The little guy who had been standing next to me took off and tapped me on the shoulder as he flew across me. Now that is as good as it gets. As unnatural as I knew it was for all these young pelicans to be seen clustered around humans and their smelly little fish dumpster, there was something more going on that my untrained eyes were unable to see. Many of them appeared to be wet and were, somehow, never drying. Then I read an article in the Del Norte Triplicate (a local newspaper) on July 24, 2012, about the tearing down of the fish cleaning stations in Crescent City because the Brown Pelicans were suffering from what’s called “oiling”. There was a pipe attached to the cleaning station tables that lead down to the water where the pelicans were swimming and it was dripping right on top of them. Through further research I found out about a project called the ‘Northern California Harbor Pelican Injury Reduction’ project, which was initiated in 2012 as a result of a study done in northern California harbors from Shelter Cove to Crescent City. A researcher from Pacific Eco Logic, D. Jaques, had been observing juvenile pelicans at fish cleaning stations the same summer I had my “close encounter”. He notified the California Fish and Game and wildlife rehabilitators. 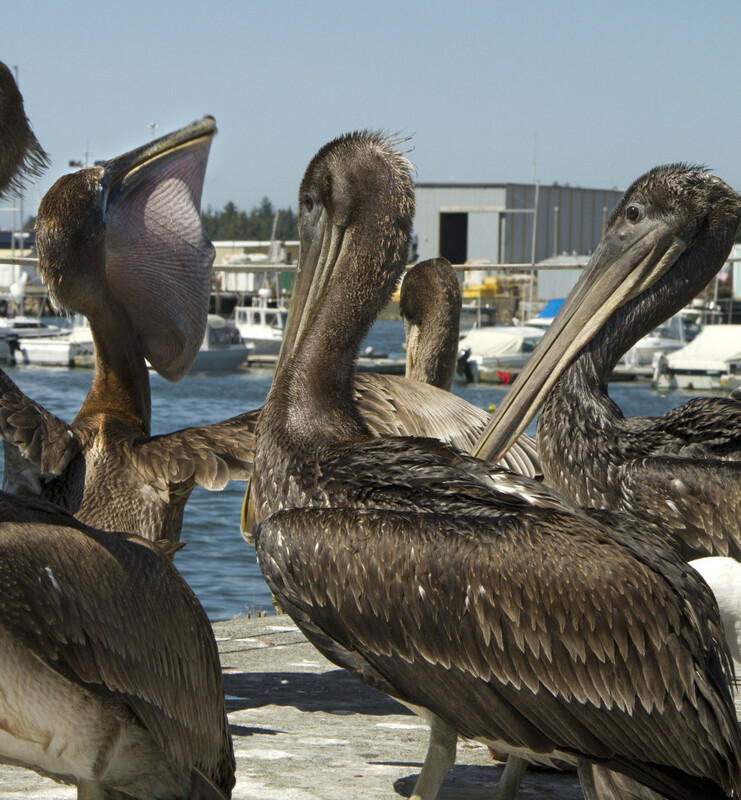 Bird Ally-X took in 50 pelicans, examined them and found acute problems with oiling and gullet impaction along with other problems caused by human interaction at fish cleaning stations. 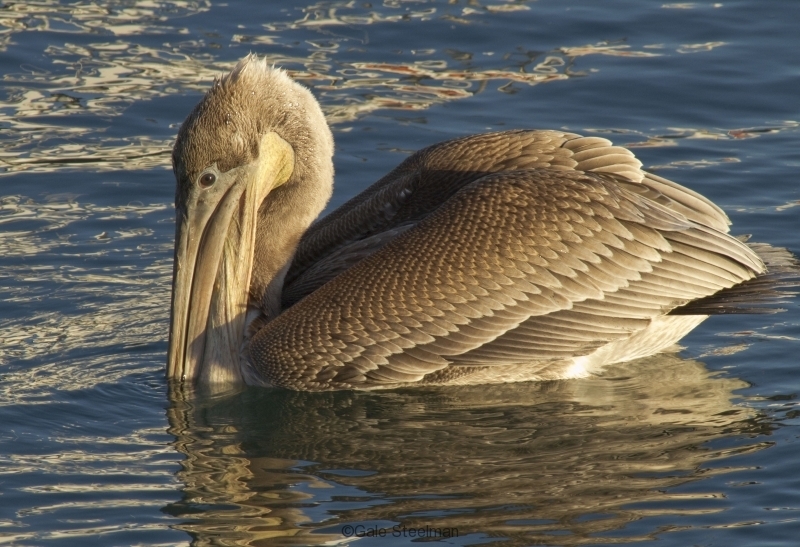 Bird Ally-X and Pacific Eco Logic initiated the ‘Northern California Harbor Pelican Injury Reduction’ project and launched field work in 2012. They, in turn, worked with harbor districts in northern California to solve the problem with the fish cleaning stations. The Crescent City Harbor Commission jumped into action to solve the problem of open fish cleaning stations by installing completely new ones, each with a solid gate. As of late, I have seen absolutely no young pelicans near the fish cleaning stations and they are all out diving in the open sea and bays once again as they should be.